1. Self-esteem: One of the reasons why you are shy is because you have low self-esteem. You focus too much attention on your weaknesses instead of what you do best. It is good to identify your weaknesses, but you have to do something about it in order to boost your self-esteem. 2. Personal weaknesses: What are your weaknesses and what can you do about it? Eliminating your weaknesses will increase your self- esteem and self-confidence. Weaknesses can be bad habits or lack of certain skills. Take gradual steps to replace your bad habits with good ones. If you are lacking in certain skills then the best thing to do is to make an effort to acquire the necessary skills as soon as possible. 3. Skill learning: As an example, the diplomats are weak in English. The best thing they can do is to take intensive courses to brush up their English and at the same time involve themselves more often in situations where they have to use English. There is no other way to master a language except to use the language every day in order to be proficient. 5. Forget yourself in the company of others: Now that you feel good about yourself you are ready to mix around with people. The most important thing to remember is not to think of yourself in the company of others. In other words, don’t be too self-conscious. 6. Don’t think of your weaknesses: The other point is not to look at yourself negatively. Always put yourself in the best light. 7. Don’t worry: The last thing to forget is about the mistakes you have made in previous gatherings. Relax and be cool, calm and collected. 9. Talk about the other person: The other thing that you should do is to encourage the other person in front of you to talk more about himself or herself. While listening, look for pointers to compliment him or her. 10. Be sociable: As you get used to meeting people you should mix around more often. The rules are still the same; you forget about yourself and just participate in the conversation and encourage others to talk about their interests and you look for things to say some nice words about them. You will find that not only you are no longer shy but you are getting popular in the company of others. Do you think this article is helpful to overcome your shyness? 2. Be appreciative: Appreciate your talents, appreciate the support from your family members and be thankful to your friends and colleagues. .Adopt an attitude of gratitude in life. 3. Empathetic: Do not think just for yourself; consider the other person’s point of view and his or her feelings. 4. Thoughtful: The easier way to show how much you care is to remember someone’s birthday and send a gift. The other thing that you can do is to share with your neighbor when you have cooked something special for dinner. 5. Love: Love yourself and love your family. Bear hatred to no one but fill your heart with love. The only way to have peace of mind is to forgive and forget. 6. Humble: Be friendly and cheerful. Greet people you meet and smile. There is no need for you to show off because there is always someone who is better than you. 7. Serve: Participate in community services or provide tuition to poor children in subjects that you are good at. 9. Thankful to God: Thankful to God that you are alive and living a wonderful life and enjoying what you have. Just count your blessings. Your sharing and caring attitude will make your life richer than your material wealth. 1. Have an aim in life: They know what they want in life because they know their interests and passion. They work on it every day. They fill their life with enthusiasm, excitement and satisfaction. There is a direction in life and for them life is fulfilling. 2. Kind: They hold no grudges against anyone. Their hearts are filled with kindness instead of hatred and resentment. Their mind is peaceful and calm. 3. PMA: They are hopeful in life. They look forward to each new day with high hopes and expectations. They are optimistic about their future. 4. Positive emotions: They feel good about themselves. They are cheerful and they like the way as they are. 5. Live in the moment: They don’t dwell on the regrets of the past and they don’t worry much about the future. They just focus their attention to enjoy what they do at the moment. 6. Keep fit: They live a healthy lifestyle. They exercise every day and they follow a balanced diet. They sleep well and they are early risers. 7. Connected: They are not loners. They have a tight family unit. They have mutual friendship and network. They have good support system that they can depend on. 8. Enjoy what they have: They are not greedy people. They make the best of what they have. They count their blessings instead of wanting more in life. 9. Just be happy: It is their nature to be happy. After all it is a part of positive emotions. You make a choice: to be or not to be. Why not be happy and be upbeat in your mood? 10. Live within their means: As they are contented people, they don’t look for more material wealth. Thy have no financial worries because they have no debt. Happiness boils down to how you feel about yourself. Just think happy thoughts, be happy and you make every minute worth living. 1. Loan: The moment you are in debt you are in danger water. One wrong move you will enter into a crisis situation. The most important thing is to factor in the loan amount into your monthly budget. If your budget cannot accommodate the extra amount, do not go for the loan. 3. Terms and conditions: Shop around for a loan, go for one which has the best terms and conditions in your favor. 4. Settle credit cards bills promptly and fully every month: This is to avoid high interest charges on outstanding amount and late charges. When you opt for the minimum amount to pay you are building up debt to a point that is beyond your means to settle. It finally leads to bankruptcy. The other thing is to build a flawless credit record so that in future when you do need a loan you can get better terms. 5. Emergency fund: It is prudent to keep three to six months of emergency fund to meet the usual payments and expenses just in case you are out of work. 6. Spend wisely on needs but not wants: Curb the urge to buy what you want, learn to be happy with what you have. The less you spend the more money you will have for your retirement and the more likely for you to enjoy your financial freedom in your golden years. 7. Budget and follow the budget: The moment you spend more than what you have earned you are in debt. The worst thing is that getting into debt is easy but getting out of it is the most difficult thing to do. Spend less than your income is the only way to sleep soundly at night. 8. Avoid gambling: Don’t be greedy. There is no way to make money out of gambling or else gambling outlets will be out of business. 9. Distinguish between good debt and bad debt: You can borrow to further your education or when it is a solid investment like the purchase of a property in prime location. Don’t do it when there is no return on the amount borrowed. 10. 开源节流（kai yuan jie liu）: This is a Chinese proverb. It literary means to open up more income streams and reduce outflows. It sums up the golden rule of personal financial management. When you are debt-free you are the happiest person in the world. The following are important areas in lifelong success. Have you got what it takes to be successful in life? 1. Effective use of time: You don’t manage time, it is here and now. You fill the time with productive activities. The main point is not to waste time. However, you don’t work from one task to another back to back. You take breaks in between tasks. You also take time off to relax and unwind. You do not burn the candle at both ends. You make sure you have sufficient sleep at night. 2. Health: The quality of your life depends on the state of your health. You work harder, enjoy more and get more out of life when you are healthy and fit. 3. Simplicity: The most important things are to do less and go slow. Do not cram and do too many things in a day. Do one thing at a time. Enjoy the moment; look at the setting sun and the rising moon. Be appreciative of nature and its wonders. 4. Relationships: The only way to make people like you is to take a keen interest in other people. Develop a pleasing personality by being humble, cheerful and approachable. 5. Creativity: To be successful you need to be resourceful and creative. It means you think, imagine and create original and unique ideas. It is the same in wring articles. All the subjects are already written, so when you write it has to be different from others. 6. Happiness: True happiness is from within; it is not what you have or in the distant future, just think of happy and cheerful thoughts. Do remember that this is one of the things in life that is within your control. So, choose happiness instead of misery. 7. Character: Be a trusted person; deliver what you have promised. Be enthusiastic and do more than expected. Discipline yourself to do only the right things. 8. Goals: Do you have goals in life? Goals direct your energy and you focus on doing the task leading to your objectives. Don’t drift aimlessly in life. It is a waste of time and energy and there is no fun and excitement in life without meaningful goals. 9. Organization: It is more effective to put your goals in writing so that you can plan and arrange your tasks ahead in an orderly manner. Likewise, you need to organize your life so that it is balanced. Life is a juggling act. You have to take care not only yourself, but your family, your friends, your work and react to things beyond your control all at he same time. 10. Positive mental attitude: Be sure of yourself that things can be done and problems can be solved. What you need is perseverance to go all the way. You may fail but you keep trying and learn from defeat. This is a competitive world and we need to be outstanding to achieve lasting success in life. 1. Think: The most powerful way is to tell yourself that whatever you do, there must be a better way. On a daily basis look at the things that you are doing critically, think and find out how you can get things done in less time without sacrificing quality. Can you do away with it? Can you simplify it? 2. Change: Insanity is doing the same thing, over and over again, but expecting different results. The key word here is change. Do a thing in a different way, experience it; test it until your get a better result. The reasons are that imitators are creative. They copy the ideas and they adjust, combine, modify and improve the concepts to suit their own needs. In the article, researchers looked at 48 innovations and discovered that 34 of them- almost three-quarters - were copied. 4. Observe: Study and examine to see how things are done. A lot can be learnt from others. Capitalized on their good points. 5. Read: The more you read, the more you know about how things get done. The more you know the more innovative you are. 6. Sleep: Think hard about your problem and sleep over it. Let your subconscious mind work on it. You never know when you wake up the next day; the answer is already in your mind. By the way, when you sleep well, your mind is refreshed and you can think better, it means you will be more creative. 7. Relax: You can’t be creative when you are stressful. Learn to unwind and relax. Creative juice can only be nurtured when you are cool, calm and collected. 9. Talk: Get away from your work and talk to someone about everything and anything. Shift your mind’s focus. Ideas can occur while you talk casually to someone. 10. Ask: To ask is to probe. Find out the what, who, why, when and how of everything to satisfy your curiosity. What you get may give you the “Ah- Ha!” effect to your problems. To be more creative, think more often, read more widely, observe more carefully, ask more questions, identify more bright ideas and make more changes. 1. Freedom of expression: There is no restriction to what you wish to write. Write things that you are interested in. This is a platform to express yourself freely. The best part is that you share your feelings with every one on the Net and they comment on what you have said. 2. Writing: The more you write the better it gets. 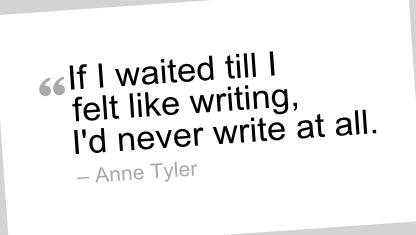 You develop quality in writing after writing continuously for many months. The most important thing is to start, write daily and become a good habit. 3. Making money: Money is only a by-product of what you do. In this case your primary objective is about writing. Your articles attract the attention of readers because they find your articles easy to understand, useful, able to solve their problems and lift their mood. You put Adsense ads on your article pages and you earn when readers click on the ads. Write for the readers and the readers will click on your ads. 6. Building a brand: You write articles in a particular subject regularly and consistently and soon you develop yourself as an expert in this particular niche. You build up a name for yourself over time. 7. Credentials: Your articles are proof of what you know in a particular area of interest. You get favorable comments of what you have written. The articles and comments are a good gauge of what you are capable of. When you are accepted as a guest writer by other blogggers it is further proof of your ability. 8. Your credibility on the Net: You have to wait for your annual appraisal to find out your performance when you are an employee. On the Net you are appraised every day by the number of visitors to your blog. Readers’ visit to your blog is a popular vote of what you are offering. Your popularity is translated into Traffic Rank; the quality of your writing is determined by PageRank and Technorati’s Authority Rank. All these markers will determine your position on the Net. The followers of your blog are also an indication of your acceptance by others. 10. Satisfaction: As for me, the greatest reward of blogging is that I have improved my writing. However, there is still plenty of room to improve further. The next thing is that I am thrilled to see my TrafficRank and my Authority Rank go up. It is a good sign that my articles are acceptable by my readers. 1. Write daily: Cultivate the habit of writing every day so that you are always ready to write at the same time and place. When you write daily you can also post daily. When you post daily you attract more readers to your site. One important advantage is that quantity develops into quality. Even on the day you can’t write you still sit down and write something. 2. Read widely: Read newspaper headlines and articles in magazines to get inspiration for your next article. You can get more ideas if you know more than one language. 4. Maintain a journal; A journal is to record your feelings and important events in your daily life. The habit of writing journal complements your article writing habit. 5. File: Keep useful articles relating to writing tips so that you are always guided by the golden rules. You are also alerted to mistakes to avoid. 6. Titles: When a title from a book or an article catches your attention you know the title has created an impact .Study these titles and come up with your own catchy article titles. 7. Popular posts of niche sites: Read their popular articles and examine why the articles are attractive to readers. Can you do the same to attract readers to your site? 8. Your own popular posts: Look into your own posts and identify your successful articles and do mo more of the same. When you face a writer’s block what do you do? This is the best way to do and it will guarantee you that you will never run out of ideas. Go to your StumbleUpon Toolbar click “ALL” and you will see a list of topics and you click on your niche subject. By the way my niche is “self improvement”. Next you click on “Stumble” on the left. Bingo! Your will see many articles recommended by readers for readers. One or more of the articles will surely give you the inspiration and ideas to write your future articles. 10. Use a dictionary: A dictionary is more than finding the meaning of words. You can use a dictionary to enrich your writing. As an example you look up one word, you can find other words with the same meaning. Pick and choose the right word or words to suit your article. Wine is aged to mellow. Writing quality articles is also for the long term. The more and the longer you write the better will be your writing. Your articles will be more mature, punchier and more captivating. 1. Look for solutions and not dwell on the problem: Don’t dwell on a problem far too long. Instead, use your energy to brainstorm and come up with workable solutions. Just do something about it. 3. Accept things that cannot be changed: For things that you cannot change, don’t fight, just live with it. Don’t think of undoing something that you have done. Just accept it and move on in life. 6. Meditate: You get peace of mind and calmness by doing yoga or Tai Chi. You react to things sensibly and squarely. 7. Be aware of your emotions: Be able to know your mood and control your emotions. The most important thing is to avoid negative emotions such as worry, fear, and sadness to occupy your mind. Replace them quickly with positive emotions like happiness and cheerfulness. 8. Look at the bright side: Be optimistic, if there is a will there is a way to overcome your worry. Have confidence in yourself to solve problems in life. 9. Proactive: Instead of reacting to things you make things happen to avoid things that you are worrying about to happen. You worry about the condition of your car so you service your car regularly to avoid your car to be out of order. 10. Exercise: Getting physical exercise like jogging is one sure cure for your worrisome mind. Jogging relaxes your mind. It clears the clutter in your thoughts and you can think clearly and react to things positively. The best thing to do is to take control of your life. There are fewer things to worry about and you have more time to enjoy life. 3. Relax: This is to unwind the tensed body after a hard day’s work. Your body cannot be under tension at all time, it will break. Learn to relax. You can listen to music, play your favorite musical instrument or do yoga or Tai Chi. 4. Sleep: A good night’s sleep is to restore and regain your energy and repair damages done to your body during the day. 5. Eat: The most important thing is to eat your breakfast. After fasting for about eight hours your need nutrition to provide you with energy to start a new day. Eat at regular intervals to train your body to expect food and burn calories. Eat less at each meal but more often. Avoid junk food especially the three whites (white bread, white sugar and white rice). Drink a lot of water and consume more fruits and vegetables. 2. Uncluttered: Be in a cool, calm and collected mind daily to get things done. 3. Exercise the brain: Read widely, do puzzles, learn a new language and do daily physical exercise are all good ways to promote your concentration and memory. 5. Great patience and courage: Be resilient in the fact of defeat. Bounce back from each setback. 2. Moral values: Live with a clear conscience by doing what is right and ethical. 3. Giving: Be generous and ready to serve. Share what you know and what you have. 4. Contentment: Be happy with what you have and avoid greed. Don’t allow your calm mind to be disturbed by wanting more in life. 5. The law of “karma”: According to Deepak Chopra in his book, the Seven Spiritual Laws of Success; he mentions that every action generates a force of energy that returns to us in like kind… what we sow is what we reap. And when we choose actions that bring happiness and success to others, the fruit of our karma is happiness and success. 3. Connect: Networking with like-minded people and learn different ideas from them. 5. Create: Think, imagine, conceive and create new ideas. Be unique and original in getting things done. 2. Control: Knowing your mood means you are able to decide the best moment to get things done to avoid outburst of anger and resentment. 3. Positive emotions: Think of happy thoughts and be cheerful and replace negative emotions quickly. 5. Live with the inevitable: Don’t fight with things that cannot be changed. Accept and move on in life. Manage the five areas of your life to achieve greater success in life. 1. To-do list: It is the best productivity tool to organize a day’s work. The tasks are prioritized and you just follow the list accordingly. There is no panic situation or stress as you are in full control. 2. One task at a time: The only way to get things done smoothly once and for all is to concentrate on one task at a time. Your mind is focused and you are unlikely to make mistakes. 3. Tickle file: This file has two sections. One section is divided into 31 slots to cover 31 days of each month. The other section has twelve slots for twelve months in a year. At the end of a month, say, December, you transfer and file items relating to January into their respective dates. Upon completion of the to-do list for the day it is, again, filed in the January folder and ready to be used next year. This file complements your daily to-do list. You don’t have to remember the things you have to do but you will get things done by checking the file every day. 4. Mindful: When you are at work leave your personal problems at home. Just immerse yourself in your work. Forget about the blunders made yesterday and the things to be done tomorrow. Live and work in the moment. 5. Think: Make it a habit to think of the work you do every day, be resourceful and creative to find better working methods for effectiveness and efficiency. 6. Dress to kill: Your smart and clean appearance will instantly project an image of confidence. Others will impressed by your packaging. 7. Speak slowly, clearly and precisely: Communicate in a strong voice, but talk in a pleasant tone so that others can understand your message easily. 8. 80/20 rule: 80% of your achievement is derived from 20% of your work done. Identify and concentrate your effort on the 20% to boost productivity. 10. Manage your emotions positively: Be aware of your emotions and avoid expression of anger or resentment. Be cheerful at work and greet others with a broad smile. Your productive habits will complement your expertise and your people skills to propel you to greater height in your career. These are the healthy habits you can implement immediately to change your health for the better. 2. Breakfast: The other important thing to get up early is that you can enjoy leisurely your breakfast. It is the most important meal in a day as you have gone on a fast for the past eight hours or so, you need nutrition to get you energy to start a new day. 3. Meditate: Early in the morning is the best time to meditate, it is quiet and the air is cool and clean. Doing Yoga or Tai Chi puts you in peace of mind and you can go about the day with full mental focus. 4. Exercise: The immediate benefit of doing exercise, say, jogging, is to release your stress. Aerobic exercise demands more oxygen intake and promotes blood circulation. Your mind is free from clutter and there is a feeling of well-being in you. 5. Positive mental attitude: Positive mental attitude promotes positive emotions such as happiness, confidence, peace of mind and mindfulness. This is one area you have full control and it is up to you to think of positive or negative thoughts. I am sure you want to feel good. Why not think of happy thoughts? 8. Drink water: Doctors are well aware that dehydration, second only to oxygen deprivation, robs life fastest. Minor dehydration is one of the causes of many illnesses. Dehydration can also cause damage of the blood vessels in the brain as 85% of your brain consists of water. 9. Drink green tea: Green tea is loaded with antioxidants. University of Purdue researchers recently concluded that a compound in green tea inhibits the growth of cancer cells. There is also research indicating that drinking green tea lowers total cholesterol levels, as well as improving the ratio of good (HDL) cholesterol to bad (LDL) cholesterol. Enjoy a cup of warm green tea every day. I usually have a cup in the evening after my dinner. 10. Control stress: The best way to fight stress is to plan ahead with a to-do list. Follow your list means things are done smoothly and stress is avoided. Health is wealth and wealth is health. How do you get things done in the office? Spend a little time to get things organized in the first place is the best way to execute your work successfully. 1. Scope of work: Find out from the outset what you have to do, when you have to complete the job. Clarify all outstanding issues before you start work. 2. Plan: Now that you know what needs to be done it is time to organize the task in an orderly manner. Design a time table with the logical sequence of workflow to complete the project well in advance and not just in time. The reason is to allow extra time to cover in case of unforeseen circumstances. The other thing is to make sure that your tools are all in working order. 3. Creative thinking: While you are working on the project, be resourceful to come with ideas to do the project in better ways. Always think of simple methods to be more efficient and effective. 5. Post-mortem: Upon completion of the project identify and take note of shortfalls. Avoid making the same mistakes in future projects. Celebrate with your staff for a job done well. 6. Day-to- day job: Organize your daily work is just as important. Carry a to-do list with you and work accordingly. Give allowance for interruptions in between to complete your daily tasks as planned. 7. Working smart: Do one task at a time mindfully. Don’t work from one task to another back to back, Take breaks in between them. Enjoy a cup of coffee, look at the scene outside the window. Don’t glue to your monitor all day long, alternate your work to avoid eye fatigue. Avoid stress by working less; just concentrate on a few important tasks for the day. The most important thing is to find happiness at work. When you enjoy working it is not work anymore. 1. Dress in good taste: Dress smartly in clean clothes and making sure that the shoes are polished and your hands and fingernails are clean. Check to see that your hair is well-groomed. Other people will be impressed by your clean and clear appearance. 2. Be prepared mentally: Be confident and sure of yourself. Your body language will show the state of your emotions. You will show nervousness by scratching your head, tapping your feet or rubbing your nose. Sit, stand and walk upright. 3. First impression. Give an impression that you are warm and sincere. Be alert and responsive. Look at the person directly when you are talking. 4. Expression: Speak slowly, clearly, fully and sincerely. Allow others to understand your message easily. 5. Build rapport: Wear a smile and be friendly. Do not start an argument. Turn off your cell phone and don’t smoke. Look around in the office and find something in common to start a conversation. .
6. Documents: Always arrange your documents in an orderly manner and avoid flipping through a file from front to back and from back to front looking for a piece of paper. 7. Arrival early for a meeting: Arrive earlier so that you are composed and collected. You will also be able to be familiar with the place. When you have created a positive impression others are receptive to what you have to offer. Living with life is a balancing act, you need to manage yourself, look after the family, get along well with others and face reality all at the same time. The following questions will search your heart so that you are aware of the things that you have done well and some of the things that are missing in your life. 1. Have I taken care of my health and well-being? Are you spending your leisure time drinking at the pub instead following an exercise program to keep fit and be healthy? Don’t allow your body to be out of shape, start today to move your body more often. 3. Have I manage my personal finance well? Are you keeping your spending within your budget? Have you set aside an amount each month for rainy days? Did you sign your credit card because you just want to have something? The most important thing is not to get into debt because getting out of it will not be easy. 4. Have I spent quality time with my spouse and children? When was the last time the whole family went out together? Have you spent time just to talk to your children about their school and find out how they are coping? Did you do the washing up and take out the trash? Don’t glue to the TV, do something at home. 5. Have I contacted my friends and made new friends lately? This is to find out whether you have expanded your circle of friends. New friends give you new ideas. Stay in touch with your old friends, don’t’ just go to them only when you have to. 7. What have I done so far to reach my goals? Are you keeping your goals in view? Have you worked on your daily tasks leading to your life goals? The daily tasks are important so that you will achieve your weekly, monthly and yearly goals. 1. Look far way: You are lucky if you are sitting next to a window, because you can look far away through the window to relax your eyes. Another important thing is to blink your eyes often. 2. Warm towel: Do it three times a day for about 10 minutes each time by covering your eyes with a warm and moist towel. It helps blood circulation around the eyes. When you are too busy you can just do it once a day. If you don't have warm towel, rub your palms against each other vigorously for about twenty times or until both palms are warm. Then, press the palms lightly on both eyes for a few seconds .You will feel a sensation of warmth. Thus, it helps blood circulation. 3. Close your eyes: When you are feeling tired, just close your eyes for a while. It is another way to relax the tense eyes. 5. Take breaks: Get away from the monitor and take a break after working for about 40 to 50 minutes. If you do get tired easily you should rest your eyes at shorter intervals. 6. Alternate your work: Instead of working on the screen at one go, alternate your work. Do filing, deliver documents to other departments or do other errands in between. 7. Look at greenery: I have a pot of plants on my desk and I look at it often. It is not only good for the eyes the plants purify the air in the office. 9. Exercise your body: One of the best ways to exercise the body is jogging. Jogging stimulate blood circulation including the blood vessels surrounding your eyes. When you jog you also look far away and the greenery along the way. 10. Wear sunglasses: Put on your sunglasses under the hot sun. Your eyes will feel comfortable and also avoid the damage from the sun’s ultra violet rays. Your eyes are the window to this beautiful and wonderful world. Take good care. What are the most dreadful negative emotions that will destroy your mental well-being? I think the following 10 sins are to be avoided at all cost. 1. Fear: Do you fear of the unknown and fear of death? Life is unpredictable and death is inevitable. The solution is to live each day fully so that you can cherish each day that you have lived well. Do you fear rejection? In life you have to ask for the things that you want. Be happy if you get it, if not, you don’t lose anything. Keep asking until you get it. 2. Frustration: Are you getting one blow after another and getting nowhere in life? Are you facing obstacles every now and then? Cultivate resilience and bounce back from each setback and tell yourself that things will get better. 3. Worry: Are you worrying about things cannot get done? Are you afraid of losing your job, family breakup and children running away from home? Are you not sure of getting financial freedom during your retirement? Most of the time the worries are unfounded. Instead of worrying, why not do your very best today for a better tomorrow? 4. Discontented: Don’t fill your heart with resentment and bitterness: Do not envy other people who are more successful and enjoying better things in life. You never know they may be living on credit while you pay in cash; you are debt-free. Just be happy to enjoy what you have and be contented. 6. Regrets: Are you always thanking of the past mistakes, failures and defeats and lost opportunities? Do not dwell on past unfulfilled events. Avoid making the same mistakes and get ahead courageously in life. 7. Impatient: You can’t wait for your turn, and you jump queue. When you drive you tailgate and you beat the red light. Do not be impulsive, slow down to live and appreciate every moment. 8. Pessimistic: Look at life with a positive outlook. Be optimistic that things will get better. Don’t short charge yourself, you can do it and you will succeed. Just try. 9. Hopeless: Are you drifting aimlessly in life? Do not despair. Set goals and work on it. Life is worth living when you focus on the tasks leading to your objectives. The most important thing is to replace quickly the negative thoughts with positive ones. Change your thinking and change your life for the better. Life is a series of problems. Those people without problems are those found at the cemetery. How do your live with reality? See problems as challenges: Build resourcefulness and creativity in the face of problems. You will be stronger with each problem you have solved. Admit mistakes gracefully: Take responsibility for you own mistakes. People will admire your strong character. Don’t look at problems but look for solutions: Don’t dwell on a problem too long. The most important thing is to look for ways to overcome the problems. Be resilient: Bounce back from defeats. You may fall but do not give up, just carry on. Be optimistic: If there is a will there is a way. Just tell yourself that there is light at the end of the tunnel. Be confident: Build your confidence by winning small successes along the way. This is an area that you have full control, make up your mind to live fully and happily. Love yourself: Be happy with the way you are. You are unique. Learn: Be curious, be inquisitive and do not stop learning. Self-esteem: Believe in yourself; think of your talents and abilities. Value your self- worth. Healthy: Take charge of your own health. Exercise daily to be fit and energetic. Be living in the moment: Forget about the past, what is done cannot be undone. Don’t worry about the future, the only way to have a bright future is to live in the moment, enjoy what you are doing and do it well. The way you treat others will reflect on you how others treat you. Treat others well. Be kind: Do random acts of kindness. Say hello and smile to the people you meet. Express a few kind words to cheer up other people. Look for the good in others: Make it a habit to find something good in others so that you can pass a heartwarming remark. Empathetic: Whatever you do take into consideration the feelings of others. Offer services. Find out what you can do for others and go ahead and do it. Your action will be appreciated. Polite and humble: To be accepted by others, be cheerful and wear a smile. Do not be boastful. Responsive: Be alert and take quick action when dealing with people. Create a good first impression. We have to accept the fact that life is not a bed of roses, but we can always look at things on the bright side, after all, every cloud has a silver lining. Do you often get up on the wrong side of the bed or do you always start a new day right? Starting a new day right means you have achieved 50% of a successful day. A new day does not start at dawn. It starts the night before. Here are the ways that you can begin a new day happily with zest and confidence. 1. The night before: Have you got the to-do list ready for the following day? Planning ahead puts your mind at ease and you go to bed with a peaceful mind knowing that you have taken care of the tasks for the next day. Sleep early to enjoy the full benefits of a good night’s rest. Your body will be rejuvenated and your system detoxified. 2. An early riser: Sleep early means you will be able to get up early and start a new day to get the right things done in the morning smoothly. 3. What do you say to yourself: Say the right thing and you will act the right way. Say to yourself that you will start a new day with cheerfulness and confidence. Positive emotions vibrate positive mental attitude and it is the most effective way to commence a new day. 4. Your morning rituals: Avoid the bad habit of puffing a cigarette first thing in the morning when you get up. First thing in the morning when I get up is to have a glass of water. It is then followed by the usual deep breathing exercise, flexibility exercise and doing a round of Tai Chi. The morning rituals allow me to start a new day peacefully, calmly and collected. 5. Breakfast: Do not neglect your breakfast. After fasting for about 8 hours you need nutrition to provide the energy you need to start a new day. As an early riser you will be able to enjoy your breakfast leisurely. 6. Avoid the newspapers or TV news: The most depressing thing to start a new day is to read the newspapers. The bad news (only the bad news is good news for the newspapers) impacts the mind negatively and zaps the energy in you. When you have warmed up yourself for a new day you have won 50% of the battle and you will go through the day with the right frame of mind. 1. Daily to-do list: Instead of commit to memory why not do a list of the things to be done? First of all, use the brain for more important job like creative thinking. As an example I focus my mind to look for inspiration to write the next article. The attention of my thoughts couples with the things that I read and see, like a bolt of lightning, I get an idea for my next article. The beautiful part of a to-do list is that you can prioritize the tasks according to their importance. At the end of the day you cross out the tasks that you have accomplished and it gives you a sense of satisfaction. 3. Tai Chi: Tai Chi is a form of meditation in motion. It helps me start a new day on the right note. The gracious movements require your full concentration so that you do not make mistakes from one movement to another. At the end of the session I feel cool, calm and collected. 4. Supplements: A multi-vitamin and mineral supplement is like an insurance cover. You do not know what is lacking in your system. A caplet a day will take care of it. I also consume one calcium tablet and one glucosamine capsule to strengthen my joints, bones and cartilage because I jog regularly. As I am always glue to the monitor at work I also take another capsule consisting of eyebright, bilberry, lutein and ginkgo biloba to fortify my eyesight. 5. Positive emotions: You make choices in life. Do you choose to be cheerful or feeling down every day? I always tell myself to be happy, confident, appreciative instead of miserable, discontented and worrisome. 6. An article a day: The habit of daily writing about self-improvement improves my writing skills. The added advantage is that I am reminded by my motivational articles every day to look at life positively and live life happily. What are your beneficial habits? Please share with us. 1. Self-expression: You can be creative and write in your own style and in your own unique way. How you write and what you write the sky is the limit. You can write stories, poems, articles, books… the choice is yours. 2. Practical things to do: It is essential to make lists, write reminders, notes, instructions, thank-you notes, letters of appreciation and many more. 4. Complex thoughts: Complicated ideas cannot be vividly expressed in spoken words. However, you can clearly organize them logically and concisely in writing. 5. Develop into an expert in your field of writing: The more your write about a particular subject the more you develop yourself into an expert in it. 6. Job-related: The ability to write well is a prerequisite in white-collar jobs. Writing memos, presentations, all sorts of letters, executive summaries and reports are all part and parcel of the job. 7. Therapeutic: It is more effective to express your feelings in writing than by speaking. Keeping a journal is an excellent outlet to vent feelings. Writing is a good way to let go without hurting anyone. In order to write well, it is necessary to read widely to get inspiration. The pen is mightier than the sword; it sums up the power of written words. 1. Don’t dwell on the result: As an example when you prepare for an important exam, your focus is to revise and cover all the subjects well and do your best in the examination. You will not tell yourself that “I must get straight A’s in all subjects.” Attaching too much attention to the result will impact your mind negatively when you do not succeed in getting all A’s. It is a blow to you and when you cannot take it, it may lead to a nervous breakdown. 2. Health and fitness: Physical fitness provides better cushion to face problems and setbacks in life with resilience. You think of solving the problems instead of the failures itself. 3. Reaching out: The fact that when you have a problem and you talk to your trusted friends to get emotion support is in itself already one way to ease the anxiety in your mind. Moreover, your friends will also give you ideas to deal with your problems. Don’t allow anxiety and worries to occupy your mind. 4. Positive emotions: Decide to start a new day on a happy note. Be cheerful and feel confident about yourself. Feeling good about yourself relaxes your mind and you go about the day calmly. 5. Avoid stress and pressure: Do not allow too much work to make you stressful and get on your nerve. Plan your day well by doing only a few important tasks. Take breaks between tasks to ease the tension in you mind. 6. Ability to manage your emotions: Be aware of your emotions and act accordingly. When you are in a bad mood you will not say or act in a haste. You will do it only when you are composed. Avoid outburst of anger and frustration. 7. React to events positively: One such event is retrenchment. It is very stressful and your mind is filled with anger, resentment and frustration. The most important thing is to get over the negative period as quickly as possible. Think of opportunities instead of the job loss. Life is full of ups and downs. It is important to adopt a positive outlook in life. If there is a will there is a way. Personally I find the following things that I do is effective to keep me healthy and happy. Why not incorporate the routines into your daily life? You will be glad you do. 1. Sleep early and sleep well: The fact that sleep occupies a third of your daily life means it is essential to have sufficient sleep to maintain good health. Sleep deprivation lowers the functioning of your immune system. You are also not alert and you cannot concentrate well and so your efficiency is reduced. 3. Be happy: Happiness and health complement each other. Happiness promotes good health and good health stimulates happiness. Crack a joke and laugh out loud with friends and relatives every now and them. Happiness is uplifting and affects your health positively. 4. Manage stress: Organize your daily life in an orderly manner to avoid stress. Learn to relax and meditate by doing yoga or Tai Chi. Do deep breathing every day to make your lymphatic system work better. 5. Exercise every day: There is no health without exercise. Life is about movement. The more you move about the better it is for your health. Vigorous exercise promotes bloods circulation, sweating, detoxification and releases stress. 6. Avoid bad habits: Stop smoking and drink moderately. Smoking is not only bad for you and others and it is a dirty habit. Cigarettes butts and ash add more trash to our worsening environment. 7. Glorious Food: The most important meal in a day is your breakfast. After fasting throughout the night you need nourishment to start a new day with zest and energy. A balanced diet means to eat a variety of food; more importantly consume extra fruits and vegetables. Avoid preserved food and food added with preservatives. These are junk food with little or no nutritional values. Eat less in each meal but more frequently at regular intervals to train your digestive system when to expect food and burn calories. 8. Enjoy life every day: Live life fully and enjoy now. Be mindful of what you do every day. Do not go through life mechanically like eating, dressing and driving while your mind is somewhere else. Slow down to appreciate every moment in life. 9. Purposeful living: Do you find emptiness in life, drifting aimlessly with nothing to look forward in life? Set goals in life to avoid hopelessness and depression. With goals you live with hope and expectations. 10. Positive mental attitude: A positive mindset promotes positive emotions. Positive emotions such as cheerfulness and confidence enhance well-being and promote good health. Cultivate thoughts of love, faith and joy to boost good health. Health is gold. Its value appreciates in time. With health you can do anything and go anywhere in life. It is your passport to happiness and well-being. 1. Expert in your own field: What are you going to write about in your blog posts? It should be a subject that you are knowledgeable. You can also start writing about something you are interested in, you will slowly develop over time to be an expert in your own field. 2. Serve a need: Do your articles provide solutions to the problems of the readers or provide a need to the general public. The most important thing is to write for the readers. Find out the interests of your readers and write accordingly. 4. Consistent: Aim to write and post an article a day. Just like doing business, your shop should open daily as expected by customers or else they will go somewhere and never return. According to Blogpulse there are more than 126 million blogs on the Net. 5. Long-haul: Think very long term. To be successful, think of years instead of months. Be consistent and persistent. Just write and write. Internet is a level playing field and you are competing with many other better bloggers. 6. Ongoing improvement: Improve in every aspect of your blog. Write more unique and original articles, make your site easier to navigate. Avoid clutter and let your readers find your articles easily. Be on the alert to protect your reputation on the Net. Create Google Alerts to find out what others are taking about you. Take immediate action if there is character assassination or data misuse. 1. Health: You are physically perfect and you enjoy robust health and you are full of energy. You are one of the happiest people in the world because you can move around freely to enjoy the sound and sight around you. Think of all the handicapped people in this world and you will be able to treasure your physical well-being. 2. Happy to enjoy what you have: Just think of your dwelling, your car and all the electrical appliances in your house, the clean water and the internet connection. Don’t you think you have a comfortable and marvelous life? 3. Your work: You are a valued member in the company. You enjoy your work and you find satisfaction in your work. Your work gives you high self-esteem. Think of those jobless people who are depressed and low in spirits because there is no income without a job. 4. Financial freedom: You receive your pay check regularly. You may not be wealthy but you have accumulated some savings and investments for a secured future. More importantly you are debt-free. Think of those people who are deeply in credit card debt and you will know how lucky you can be. 5. Relationships: Think of the support you have got from you family, friends and relatives. These are the people you count on every time when you need help. Be appreciative of the closeness between you and the people around you. 7. A wonderful place: You live in a peaceful neighborhood and the land is also free from natural disasters. The environment is not polluted and the people are friendly. Think again, do you want to live in a place with frequent earthquake and volcanic eruptions? Adopt an attitude of gratitude to live an abundant life. In any country there is a defense system in place to combat invasion from land, sea and air. They are the air force, the army and the navy to protect a country from intrusion. Likewise your body is also equipped with a defense mechanism to protect you and look after your health and well-being. The defense mechanism consists of the skin, eyes, nose, ears and mouth. 1. The skin: Your skin is the first line of defense. It provides a physical barrier to prevent bacteria, viruses and parasites from entering your body. The continuous shedding of dead skin makes it difficult for bacteria to grow on the skin. The skin also secretes sebum that forms a protective film over the skin as a chemical barrier. The acids and oil in the sebum prevent the growth of many microorganisms. The sweat excreted by the skin contains iysozyme, an enzyme occurring naturally in egg white, human tears, saliva, and other body fluids, capable of destroying the cell walls of certain bacteria and thereby acting as a mild antiseptic. Blood clotting is another mechanism to prevent the entry of microorganisms and foreign substances into the body through the damaged vessel. 2. Eyes: Tears contain lysozyme which helps protect the eyes from bacterial invasion. 3. Mouth: Similarly, saliva also contains lysozyme to protect the mouth from bacterial entering into your system. 4. Nose: The mucous membrane of the nose has mucous-coated hairs that trap and filter microorganisms, dust and pollutants from inhaled air. 5. Ears: Earwax is produced naturally by glands in the skin of ear canal (outer part). The wax is a defense mechanism meant to trap dust and dirt particles before they reach the eardrum. As you know prevention is better than cure, the best defense is to maintain the cleanliness of your body by taking frequent showers especially in tropical countries. Drink plenty of water to keep your skin and body hydrated and stay away from polluted areas. Wash you hands after using the bathroom and before eating and make sure that the food is properly cooked to prevent food poisoning.